We initially brought a few of the new-to-market RediDriver gas powered post pounders last winter to test a sort of rental program for our customers. We knew how much we loved these machines, but we wanted to make sure our customers would love them just as much. It turns out that they may even love them more! Seeing how happy these make our customers, we’ll be ordering more and have produced a video to showcase them. You can read all about the 10 day rental program on our website. How do I prevent my dog from digging under the fence? Yippee! Freedom is so close I can almost taste it! 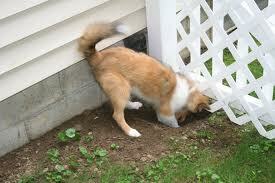 There are few things more frustrating than a dog that continually digs under the fence. Not only does it tear up your yard and make a mess, but more importantly it’s a safety liability for your dog. While there are no necessarily perfect answers, here are some possible remedies and solutions to help you prevent your dog from digging under the fence. There are a lot of behavioral suggestions below, but perhaps the easiest and most practical tip we’ve been given is to put stakes deep into the ground. Now, this could be impractical if your dog digs all over every inch of the fence, but if your dog has a penchant for digging in one area, this could be a good solution. Purchase some stakes or rods; hardwood, rigid plastic or metal will do. A camping store may have some good tools for this in the tent section. Drive the stakes deep into the ground, spacing them apart in such a way that your dog can’t dig in between them. This largely depends on the size of the dog that is doing the digging. You’ll need to drive the stake 2-3ft into the ground for it to be effective. Above everything else, ensure that you drive them deep enough into the ground so that no one will trip on the them or your lawnmower blade won’t suffer. 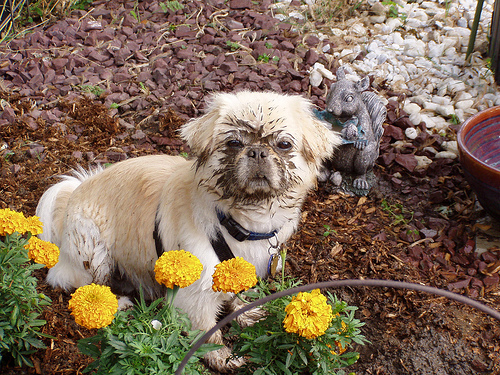 If it’s hot, your dog may be digging to find a cool spot in the dirt to lay. Ensure that your dog is not left in the heat too long, and that s/he has plenty of access to water. If you notice your dog digging only when it’s really hot, or that he is laying in the hole after its been dug, then chances are he may simply be trying to improvise on some natural air conditioning. Dogs can be like teenagers: Sometimes negative attention is better than no attention. If your dog continually digs despite admonishment–especially in front of you–this may be a sign that you need to give him/her some TLC such as play with him or go for a walk. A tired dog doesn’t usually like to dig, so if you’ve given him/her a bout of exercise, s/he may be more interested in a nap than digging. Having said this, we can admit that sometimes this isn’t practical (we love dogs but we understand busy lives). 4. Implement some other obstacles. Chicken wire lined across the bottom of the fence should prevent digging. Your dog will not like the feeling of chicken wire on his paws and should therefore stop. You’ll want to make sure that sharp edges of the chicken wire are not placed in a way that will hurt the dog. Alternately, you can place or bury larger rocks along the baseline of the fence. Your dog will give up quickly when he starts digging into the rocks. 5. Create a digging zone. If your dog just loves to dig for the heck of it, you may try sectioning a small area in your yard that s/he is allowed to dig. You’ll want to ensure that there are barriers that prevent him/her from escaping while providing enough fun for digging. This will result in some training to teach your dog about the safe dig-zone. If all else fails, you may want to consult a professional dog trainer for help. We’ve spent some time on the blog recently talking about the true cost of maintaining a wood fence. You can find the infographic here. 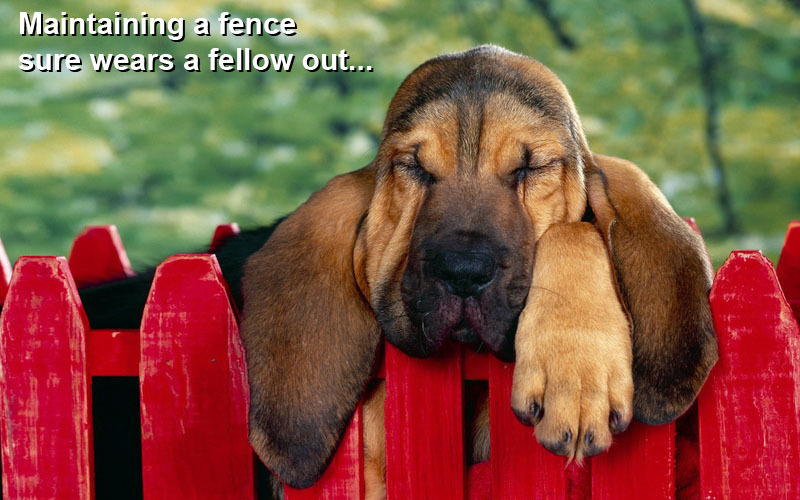 Time is money, however, and we would like to focus on the time required to properly maintain a wood fence. Maintaining your fence should be on the home maintenance roster biannually at the very least, and many professionals would recommend doing it once a year. You can use a brush to paint or stain your fence, but renting a paint sprayer will save you time. If you have a painted fence, you may need to strip the old paint first, which is a whole other time-intensive project. Staining or painting a fence can be messy and the toxic fumes aren’t good for you. You’ll also want to make sure you get a high quality, weather-resistant paint or stain to ensure longevity. Depending on the size of the fence, it can take a lot of time to do both sides. Optimally you should give it more than one coat if you really want it to look good and last against the elements. While this sort of work isn’t hard, it is time intensive and you should plain on spending a fair bit of time on this home project. If the thought of maintaining a wood fence makes you uneasy, consider vinyl or aluminum fencing. It is a truly low-maintenance solution. A simple spray of the garden hose will keep it looking new, year after year, and a good quality vinyl or aluminum will last a lifetime.